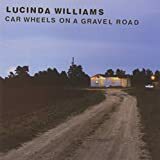 These are lyrics by Lucinda Williams that we think are kind of repetitive. 'Lonely girls' appears 21 times, 16 times as an 8-word chorus and at the end of each verse. There are only 21 different words in the song.